I spent the past two months savoring and observing and sinking deeply into U.S. food traditions on a cross-country road trip. This series highlights the traditions I had the privilege of experiencing and prompts you with tangible ways to revive, reflect, and start food traditions of your own. Often, when trying to define American food, we can get stuck searching for dishes with no distinguishable international roots—those that are purely “American.” But I’d argue that some of the strongest examples of American food culture are customs brought across oceans, adapted, and carried out here. This week, I’m departing from the places and people we met on the road to talk about the most eastern point on our path—our endpoint—Youngstown, Ohio. It’s where I’ve celebrated most Christmas Eves of my life. Great-Grandma Lorubbio and me on Christmas Eve circa 1989. 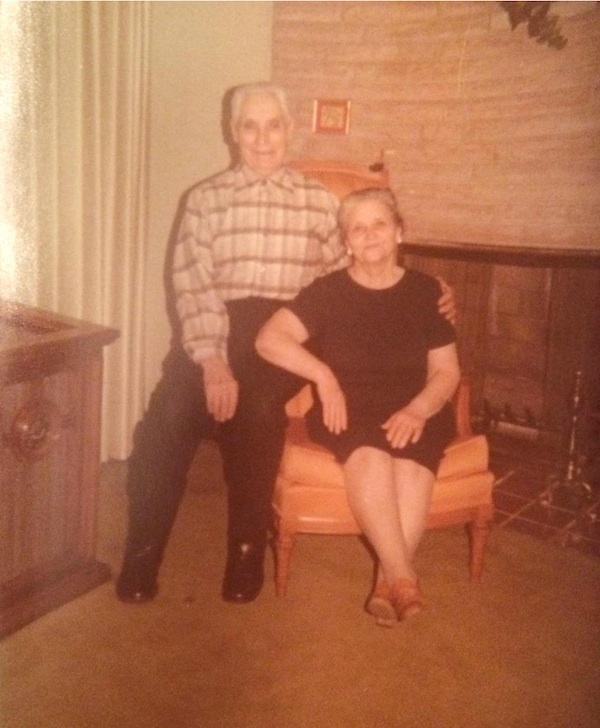 My Great-Grandma Lorubbio was a hearty woman from southern Italy who couldn’t have stood more than five feet tall. Though our lives overlapped only a few years, I feel her presence in the food traditions my family still practices today. 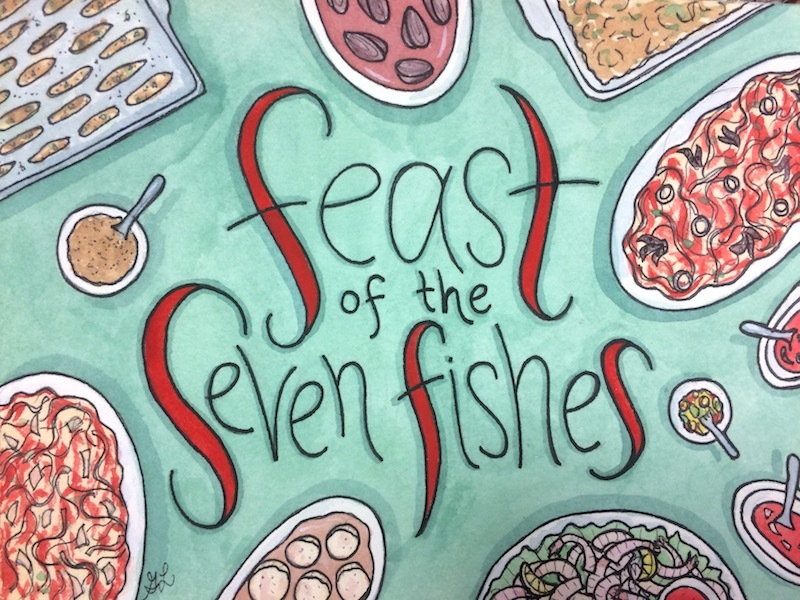 She lives on most vividly in our Christmas Eve meal: the Feast of Seven Fishes. I sat down with my Grandma Lorubbio, Uncle Carmen, and my dad, Carl, to recount our collective memory of this tradition. What do you remember about Christmas Eve at Great-Grandma’s? Carmen: I remember it being in the basement. I remember eating a lot. I remember sitting in the chair by the furnace, watching the fire. Grandma: She had her dining room set downstairs. Me: Her real dining room? Grandma: Her real dining room. Carl: Big, heavy duty, real dark wood. Carmen: I remember it being loud, and I remember a lot of laughing. What did you eat? What was Great-Grandma’s version of the meal like? Carmen: We always had squid and baccalà. Carl: Baccalà (cod), with homemade noodles and red sauce. Calamari (squid), with the same. They were two separate things. You put breadcrumbs and raisins on the baccalà. After the pasta, she’d bring out vegetables, like broccoli and eggplant parm. And wine--I remember Great-Grandpa’s homemade wine. Grandma: That was the only time of year he’d have a glass of wine after he was told he had high blood pressure. Carl: But as far as the meal, it was all homemade pasta—long noodles, fettucine. Grandma: She made them by hand. Carl: She used to cut them with a knife. She didn’t have a machine. Grandma: And they were perfect. Carl: She just rolled them out on a big cutting board or table. Grandma: Oh, smelts! We forgot. That was Great-Grandpa’s job. Carl: They were breaded and fried. Carl: For dessert, we always had Jell-O with fruit cocktail in it. You’d eat it out of the sherbet bowls Grandma still uses with whipped cream and nuts on top. Carl: After that, she’d bring out all this fruit—apples and pears and oranges. And then the nuts. She always had walnuts and hazelnuts. Everybody had a nutcracker and a napkin in front of them for shells. And figs. And chestnuts coming out of the oven. Me: Wow. After the meal? Carl: Yeah. There were nuts and a glass of wine and visiting. After that, we’d open gifts. Carmen: The kids did the dishes, though. They always made the kids do the dishes. Cousins gathered around Great-Grandma's basement dining table in the 1970s. I’m curious what the Christmas Eve dinner will look like in the next generation. Carmen: There’s supposed to be seven, and we’re down to two, right? Grandma: No, three or four with smelts and orange roughy. Me: Let’s be lenient: shrimp, too. Grandma: With shrimp, that makes it five. Carl: We’ve started to learn. We know how to do it. Carmen: We always will because I love it. Carl: Truthfully, in our situation, we pushed for that tradition here [at Grandma’s]. We didn’t want it to go away. For us [brothers], we all like the food, and we have such a positive memory of that day. First of all, we only got to see our cousins once or twice a year. They were always going to be there, so that was enjoyable. Grandpa worked at the store on Christmas Eve until a certain time, and then we drove over there. You’d get in the driveway and Great-Grandpa always had his bushes lit with Christmas lights and a fire in the fireplace. When you got out of the car, you immediately smelled the fire. You walked around the back of the house, and when you got inside, it was an overwhelming smell with the sauces. Then, it was on. It was a great time socially...and the food just kept coming. Me: All of those things just meld together. Carl: It’s the experience, yeah. Carmen: We’re capable. I’m capable, and Carl’s capable--more than capable--of making it. Me: In my lifespan, I’ve seen the roles transition. I make the pasta now. [My brother] Anthony and Uncle Frank do the smelts. We also have a Dane now [my partner, Bjarke] who has experience cleaning fish. He’ll probably throw on a flowery apron and jump in. Everyone playing their part in Grandma's basement. This transcript is the result of the time I pulled out my phone and hit ‘record’ as we reminisced about the Feast of Seven fishes. I now have 50 minutes of sweet memories, laughter, and reverence for family members who have passed. It’s something I truly cherish. These conversations, like tattered recipes in old script or photos of my ancestors, deepen my connection to the foods we make and the people who passed them onto us. I highly recommend it for you. How can you document your family’s culinary history?